The second season of the HBO series is headed for Blu-ray in April. In an early announcement to retailers, HBO is planning to bring 'Treme: The Complete Second Season' to Blu-ray on April 17. From the creators of 'The Wire,' this series focuses on a recovering New Orleans in the aftermath of Hurricane Katrina and stars John Goodman, Wendell Pierce, Steve Zahn, Melissa Leo, and David Morse. 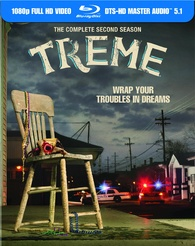 The 4-disc box set will present all 11 episodes with 1080p video, an English DTS-HD Master Audio 5.1 soundtrack, and supplements include: audio commentaries on selected episodes, scene-specific music commentaries on selected episodes, two picture-in-picture features: - The Music of Treme & Down in the Treme, two behind-the-scenes featurettes: - Invitation to Set & Walking with Wendell, and Treme Symposium. Suggested list price for this set will be $79.98. You can find the latest specs for 'Treme: The Complete Second Season' linked from our Blu-ray Release Schedule, where it's indexed under April 17.